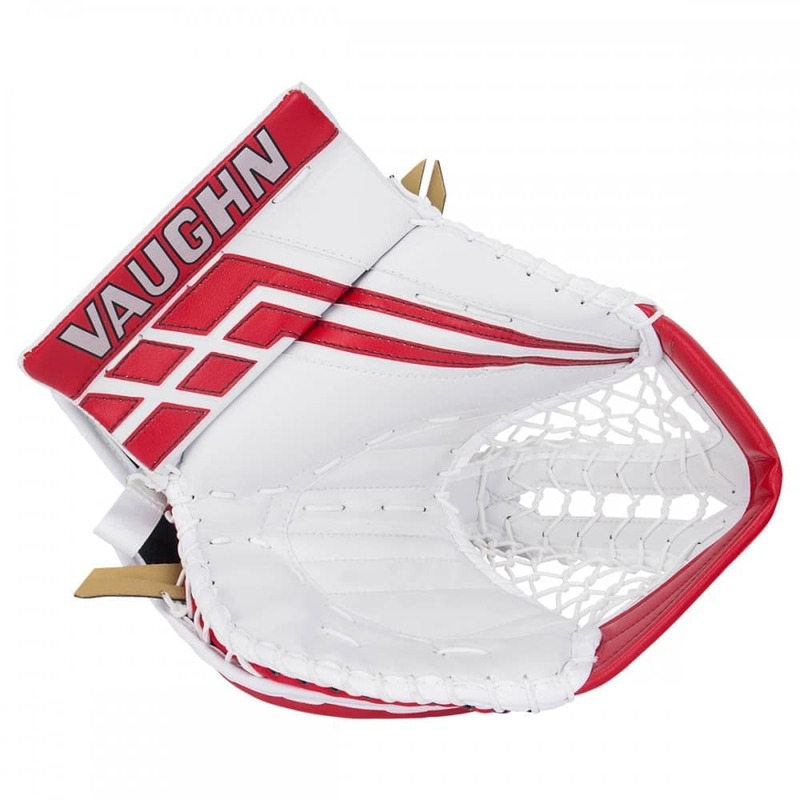 Brand new for 2018, Vaughn Custom Sports releases the newest creation in their most accomplished Velocity family line, the Vaughn Velocity VE8 Pro Carbon Senior Goalie Glove. 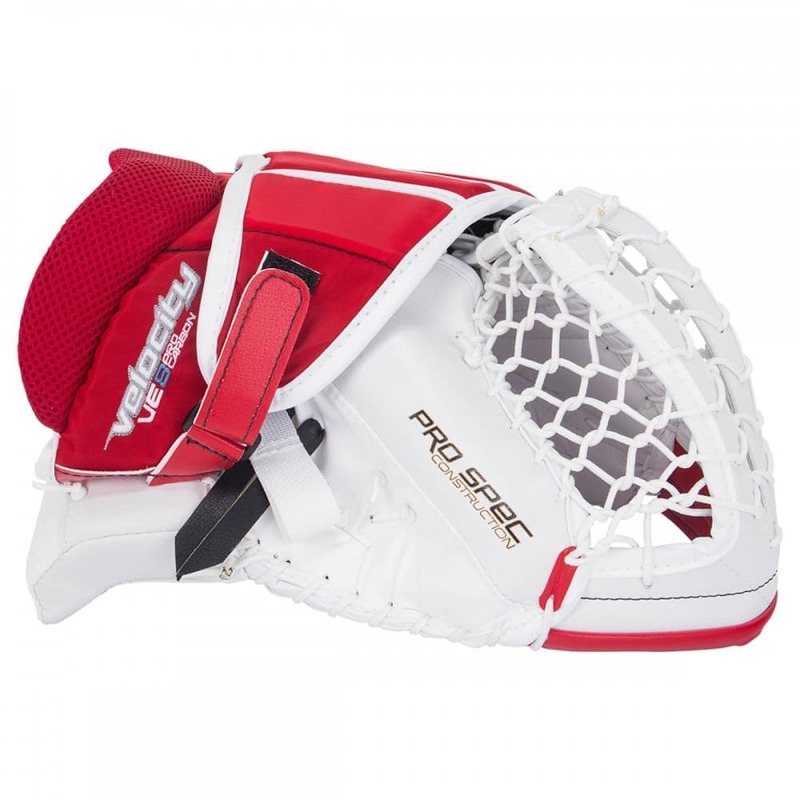 The VE8 glove is a continuation of the V7 XF glove and follows the feel of its predecessors. 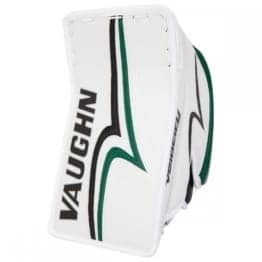 The face of the glove features a new graphic which is a slight departure from the graphics Vaughn was using before. Now, there are harder edges and lines instead of the smooth lines they were known to use. This graphic is purposely designed to be visually distracting to the shooter by creating large breaks in the lines to create a ‘netting’ type look. First, the glove has a true two piece double cuff and thumb mold, contoured to the shape of the hand to maximize surface area. Inside of the cuff and thumb is Vaughn’s carbon material which extends through to the palm further protecting the goalies hand. Extra finger reinforcements add to the rigidity towards the finger side which fights against potential finger curl. The VE8 features a new Double T to give a visually wide pocket, but comes together as a Single T when it connects to the perimeter. 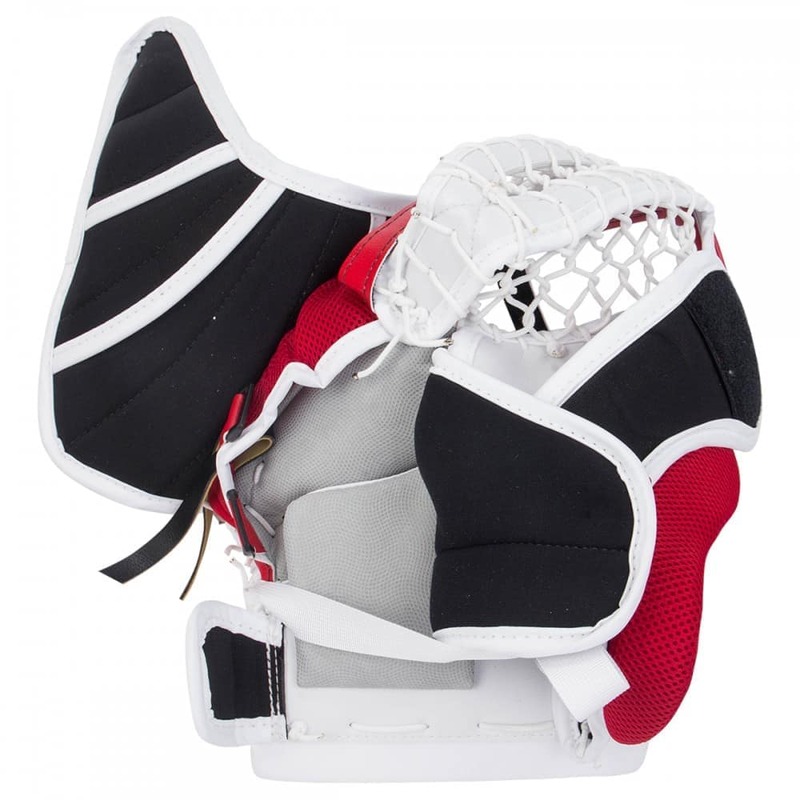 This new design allows for a super snappy closure due to the removal of material that could bunch up when the closing the glove. 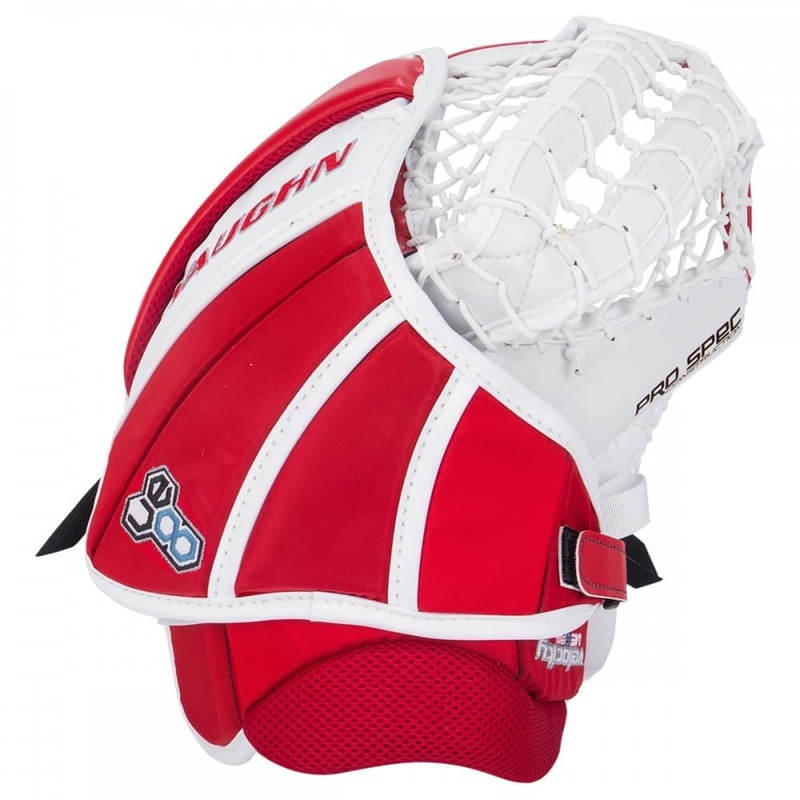 The inside of the glove features a full grip interior to give the goalie more grip while still offering the traditional Vaughn feel. Along the internals of the glove there are raised finger rails to allow for extra grip and strategic straps designed to further keep the hand in place. These straps are located across the back of the finger digits and across the back of the hand. Finally, a large dual wrist strap is attached to give the glove a completely custom and secure fit. 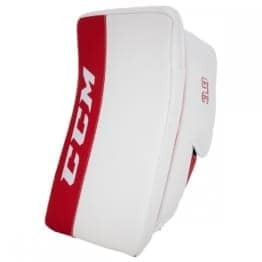 The glove now features an extra wide four piece backhand protector which is designed to give the glove maximum amounts of flex when being closed, but also protect the in any RVH setting or when covering the puck. New for the VE8 model, you will see a new hybrid-esque Double T which files into a Single T where it connects to the perimeter. 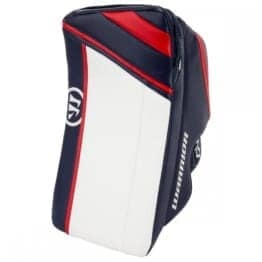 This new design helps create visibility into the pocket, matched with a soft style catch without the extra bulk of 2 spines hindering closure. Compared to the Vaughn Velocity VE8 Pro glove, the VE8 Pro Carbon glove will feature higher quality materials and a North American build. 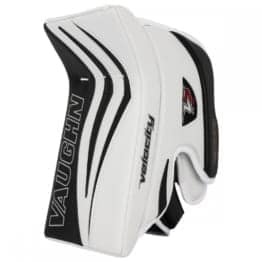 If you are a Vaughn Velocity enthusiast that wants a new improved feel that is based off of the traditional Velocity style gloves all encapsulated in the North American factories, look no further than the Vaughn Velocity VE8 Pro Carbon Senior Goalie Glove.